Before Korea entered the Olympic Winter Games in 1948, Koreans played really traditional games during the winter, usually to keep them warm or to distract them during the harsh winter cold. As you probably know, Korea is a country that, even as it has its vast developments, holds on very dearly to its traditions. It may be buildings, customs, games, food, whatever you can name, Koreans always look toward the past with a twinkle in their eye. It is the same as the sports they do. Of course, with new sports being introduced all the time, the number of things that people can do for sports and enjoyment increases as well. As much as these sports are no longer played frequently everywhere, but mostly in certain villages and festivals, it would be great to take a look at what sports used to be the the main bulk of what Koreans spend their time on during the chilly winter seasons. As you know, there are many different Korean traditional games out there such as Yutnori (Korean board game with dice), Ssireum (Wrestling), Tuho (Arrows), Gonu (Pebbles), Neolttwigi (Korean see-saw), but I would like to introduce to you the 3 games that were widely played during their winter time: Top Spinning, Kite Flying and Jegichagi (a type of Hacky Sacky). Most of the time you see these games played nowadays is during festivals where foreigners have a chance to wear a hanbok and try out these games. In top spinning, as in many countries across the world, a player spins a wooden top with a stick so that it spins on the ice or on the ground. This game is extremely popular in the winter in Korea, usually played by children, the games that they play with the tops have different names which vary by the different regions in Korea. There are different rules as well. Great tops are made heavy with really strong tips and are often spun together with other tops. 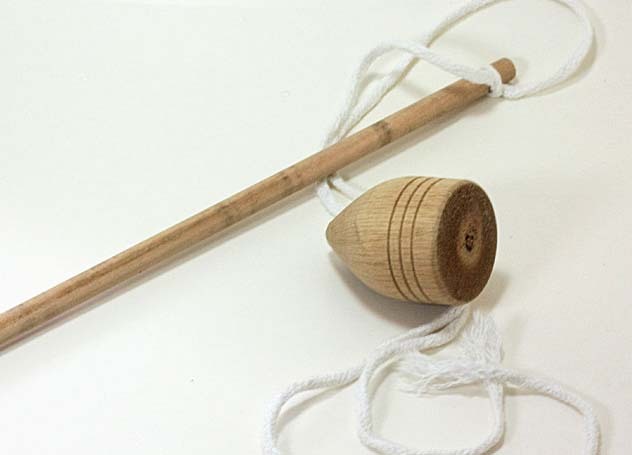 One of the games is called Paengichigi, traditionally a boys' game, it's played by spinning a round wooden top on its pointed end by whipping it out with the string attached to a stick. Players will then try to knock their opponents' tops out. The objective of the game is to keep their top spinning the longest. Another game played is called Paengineoli, spinning the top in an enclosed box and points are scored for various actions. Kite flying is a traditional winter game for children and adults alike. It's usually flown as a distraction from winter cold. It's a simple game where you have a kite frame made from bamboo with paper. They are then tethered with a string on a reel and you just have the kite out while you run and unreel so that it slowly catches the wind and takes flight into the air. 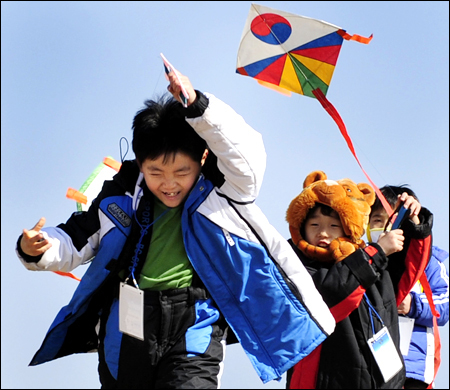 There is a period in time in Korea from New Year's Day to Daeboreum where the kite string is cut so that it flies away. Kite flying is not as common as the other 2 due to work obligations, but it's still a game played during winters. This game is very similar to the Western Hacky Sack, where players kick a jegi (a flat coin-like surface with colored paper attached) and the player with the greatest number of kicks while keeping it in the air wins. It is usually played in winter, probably because of the number of vigorous movements in a short time, jegichagi's name varies by different regions in Korea. In a one-on-one game, the player with the higher number of consecutive kicks wins and in a group game, players stand in a circle and take turns kicking the jegi. Switching the kicking foot is permitted and if a player lets the jegi fall to the ground, they lose and they will toss it to the winnter to kick. The loser is allowed to rejoin the game when they manage to catch it with their hands. 1. Heollaengi - The player must only use one foot to kick the jegi, and that same foot cannot touch the ground before the jegi falls. 2. Ddanggangaji - The player must use only one foot to kick, however, this is easier as the player is allowed to put his kicking foot back on the ground before each kick. 3. Yangbalchagi - The player is allowed to use both feet to kick. It's pretty interesting to see and know more about these games that Koreans used to play during the winter, be it for enjoyment or for distraction from the cold. I do hope that you have enjoyed the article!